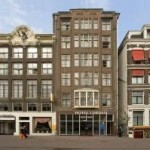 Only a few blocks away from Dam Square and major attraction, Cordial Hotel is located. It is not at all luxurious, and there is a reason for this hotel having only two stars. But, for a budget traveler looking for a bed and a breakfast, this should be good enough. If you have higher requirements, we would recommend for example A Train Hotel instead, or maybe Swissotel Amsterdam (that is though much more expensive). Cordial Hotel offers free wireless internet.